Invasive species are a major focus of conservation organizations, lake associations, and local, state, and federal government officials. The banded mysterysnail (Viviparus georgianus) is one non-native invasive species that receives little attention. Native to parts of the Mississippi River basin, Georgia, and Florida, this species was first reported in New York in 1854 in the Erie Canal. That introduction failed to establish a foothold, but in 1867 a population did become established in the Erie Canal and Mohawk River. The banded mysterysnail was first reported in the Adirondack Park in Lake George in 1997 and is now known to be present in seven Adirondack waterbodies (see below). It’s possible the banded mysterysnail is more widespread because survey protocols used for invasive plants are not the most effective at detecting this species. The first report in the Ausable River watershed was Mirror Lake in 2015. On September 14th, 2018 AsRA’s Science & Stewardship Director, Dr. Brendan Wiltse, and board member, Dr. Larry Master, snorkeled Mirror Lake to develop a better understanding of the density and distribution of banded mysterysnails in the lake. 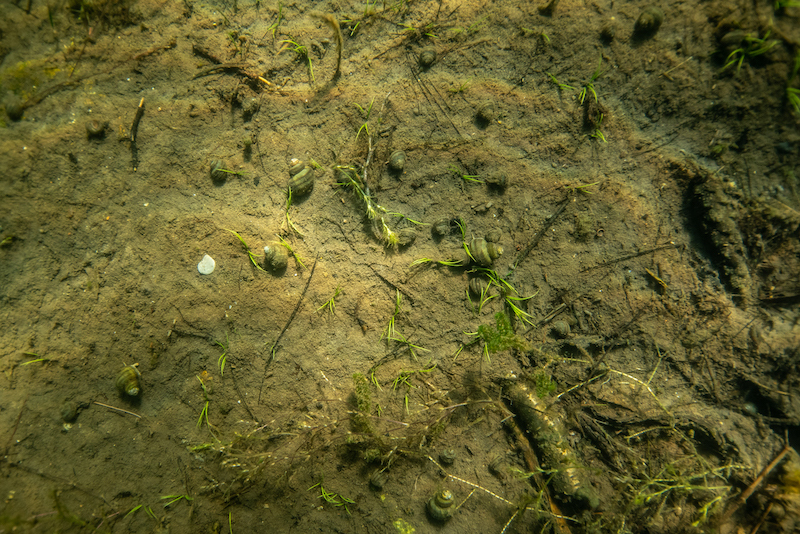 They found the snails prevalent in almost all near-shore environments in the lake. Estimated densities ranged from 10-20 snails per square meter. Banded mysterysnails live in shallow slow-moving waters, often in near-shore environments of lakes. They feed on diatoms, filamentous algae, and detritus found on the lake bottom. Densities as high as 864 per meter squared have been documented. In the fall, they move to deeper waters to overwinter. The impact of banded mysterysnail on our freshwater ecosystems isn’t entirely clear. USGS states that “at present there are no known impacts associated with this introduced species in the Great Lakes basin.” They are known, however, to be a host of a trematode worm that is related to waterfowl deaths, and they predate on largemouth bass embryos. They may also outcompete native snail species. You can help prevent the spread of the banded mysterysnail by making sure to clean, drain, and dry your boats and fishing gear. It is also important to not dump aquariums into lakes or rivers, as they may contain species not native to the receiving waterbody. There is also the potential to spread parasites and disease when dumping an aquarium. Several Adirondack lakes contain the banded mysterysnail. AsRA will continue to monitor the impacts of the banded mysterysnail on lakes in our watershed.